Envisioning began as a slide deck in 2008. I had been invited to spend a Saturday afternoon sharing professional experience and personal interests with a group of friends and bloggers in São Paulo. My job was as web designer for trendwatching.com, but the host persuaded me into talking about something I'm passionate about. The proposed talk '5×5: five technologies for the next five years' was an attempt to accurately represent technological trends with a dose of speculation. The forecast gambled on ubiquitous computing, 3D printing, personal gene sequencing, geolocation and space tourism. Despite the latter’s failure to materialize, the following years proved the speculation mostly right. The exercise of blending research and prediction left me stimulated, and I eventually decided to update the deck with more domains and educated guesses. Working with slides quickly became unwieldy, prompting an exploration of alternative methods to represent the research. 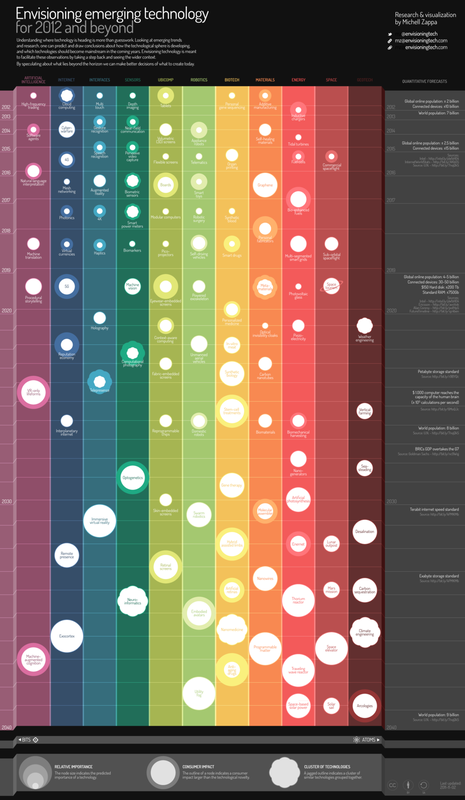 Infographics and data visualization seemed an appropriate solution for representing the interdependent and rapidly accelerating technological ecosystem. 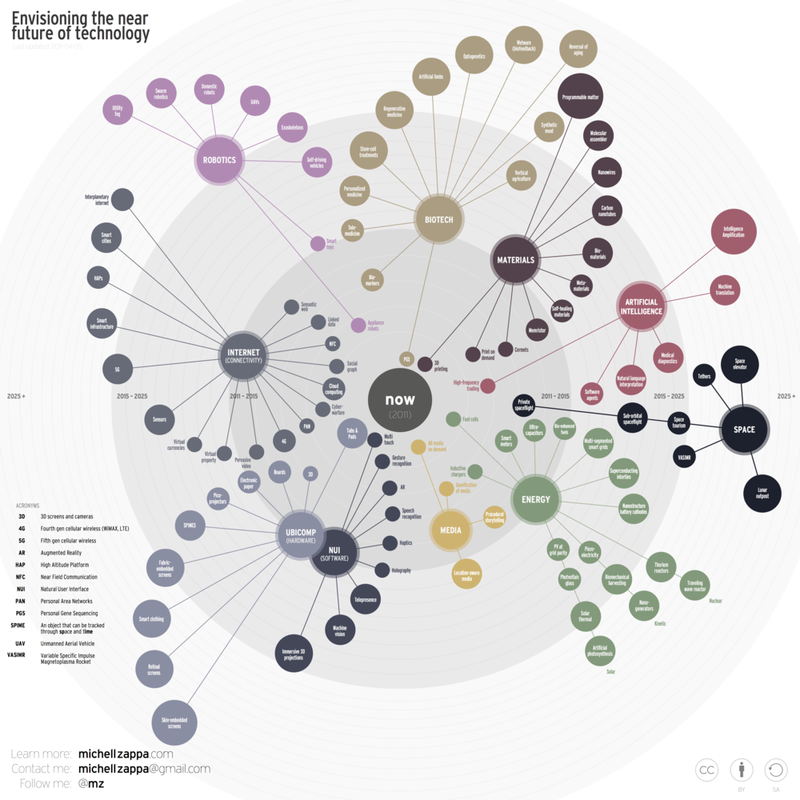 Envisioning the near future of technology (2011) displays over one hundred different emerging developments across a dozen domains. The concentric diagram represents the time period at which each technology might reach mainstream adoption. Circle size represents relative impact. Sourcing the data is challenging, as it fuses my insight from hundreds of books, articles and papers. The work is subjective, speculative and designed to stimulate conversation. Following publication of the infographic, I pinged some of the authors, journalists and designers that had influenced creation of the work. Interest in the work spread surprisingly quickly, and emails started pouring in from people in research, innovation and the public sector. Suspecting additional demand for such work, I decided to quickly revise and expand the research with an alternative diagram, depicting technologies for 2012 and beyond, published November 2011. Establishing a limited company around the work seemed like a natural next step, and Envisioning was formally established. It would take me an additional few months to transition away from the role at Trendwatching, allowing full-time dedication to the project. Demand for speaking and bespoke research proved steady. Among the first requests came from Dublin, when a design studio specialized in classrooms hosted a two-day workshop of future education. Using the infographics as basis, we together created a vision of the future classroom. The workshop output was published as another speculative infographic, depicting a technology-led migration from physical to virtual learning environments. The work was again shared widely online, bringing a steady flux of interest from people looking to collaborate. Sensing considerable technological progress in the healthcare space, I decided to develop an infographic exploring the subject matter. 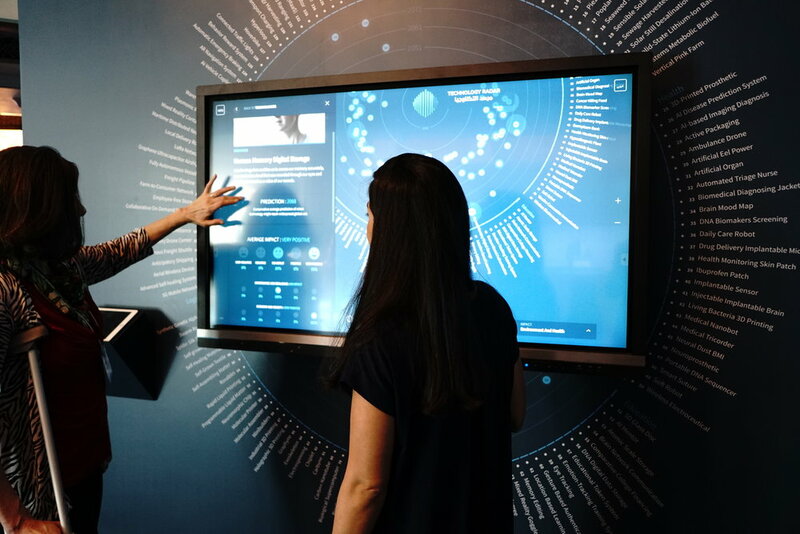 The visualization explores healthcare technologies related to regeneration, treatments, life extension, telemedicine, diagnostics and human augmentation. 2012 marked Envisioning's first research project in collaboration with government agencies. We worked with Policy Horizons Canada to jointly research and predict how technology might significantly affect key areas of the economy (including agriculture, energy and healthcare). From early days, Envisioning relied on working with subject-area experts. Collaborators were usually brought in for client-centric, demand-driven work. Sensing rising demand around financial technologies, I assembled a small team to proactively develop a paid report exploring the subject. Together we researched, wrote, designed and published a speculative report and timeline about the future of money. Sales were modest, but the experience of working as a team proved transformative. The work explores how decentralized technologies can alter distributions of power and create alternative modes of currency. 2015 marked the beginning of a revised business model for Envisioning. Instead of relying on sporadic research requests, first steps were taken towards developing a platform for maintaining intelligence on 'all' technology. With the intent of kickstarting platform creation, Armasuisse S+T commits to a multi-year horizon scanning research engagement and software development. Envisioning today is singularly focused on platform. Under steady development and extensive internal use, the platform currently tracks 1000+ technologies, dozens of active projects, and thousands of related sources and organizations. We intend on launching the platform publicly in 2019. Envisioning began as an exercise in explanation. A desire to accurately convey the staggering amount of technological development happening around us, and helping people appreciate how profoundly it might our lives. The initial infographics were licensed as Creative Commons, shared freely on the web. I grew up on a pre-commercial internet, and fundamentally believe in open knowledge. Our work today is less free/open than I would like, but this is being improved. Balancing a growing business with open access is a considerable challenge. Envisioning is self-funded and entirely sustained by clients who support our vision. I believe in forward-looking business models, and am always available for discussions about how to improve our work. Ricardo Justus, Reiner Evers, Wagner Brenner, Richard Watson, Rodrigo Rocha, Walter Longo, Parag Khanna, Kathryn Myronuk, Diana Assennato, Erin Geld, Quentin Ladetto, Peter Van, Thomaz Rezende, Arthur Soares, Cintia Ferreira, Thiara Cavadas and Rafael Pelosini.